Justice League International Annual #1, out today, is a mess. I discussed some of the issues behind that, but tried to dance around actually reviewing the title, in this week's International Exchange, the final installment of the column and the first and only one to not feature a creator interview (DiDio and Johns were unavailable). DC Comics was, at my request, kind enough to send me a copy to review ahead of time, and when I opened the envelope, Justice League #12 fell out as well. You see, while not strictly "necessary" to understand what's happening in the Justice League International Annual, the events of Justice League #12 have a direct bearing on the plot, and in more than one case the two stories seem to dance an elaborate, interwoven dance. It was when I realized this, that I went back and looked at the cover prices. Together, if you were to purchase the digital combo pack for Justice League (that's the only way I ever buy the series), you would spend $10 ($4.99 for each) in order to get the full impact of this one story. And that's crazy, because it's not even a very good story. The characterization is uneven and the de facto main character--Booster Gold--is frequently a bit off-model, both things that you might expect from a fill-in team. But this fill-in team is the Co-Publisher of the company writing alongside the Chief Creative Officer, so one assumes that they've actually, you know, READ Justice League International before. Then again, Geoff Johns has consistently gone back to the well of the pre-Flashpoint status quo of the JLI as the DC Universe's punchline, even when doing so made little sense (Batman attacked the JLI as an embarrassment during a conference call to Steve Trevor in an issue of Justice League, in spite of the fact that it's Batman and not Trevor who's involved with the team). And here's the thing--MAJOR SPOILERS COMING--this issue features a scene that I've been hoping for and waiting for since the New 52 began--and yet the whole book is so underwhelming that I'm not able to enjoy it. For the uninitiated, a quick primer on Booster Gold, the leader of the Justice League International: Back before Flashpoint rebooted the DC Universe, Geoff Johns and the character's creator, Justice League International writer Dan Jurgens, had reinvented the onetime "corporate crusader" as "the greatest hero you've never heard of," a kind of secret time cop whose safety and effectiveness in the DC Multiverse relied on the idea that his foes and even allies underestimated him. His mentor was Rip Hunter, Time Master--who was, unbeknownst to Booster, his son. Together, they adventured through the history of the DC Universe, righting wrongs and interacting with characters from all walks of life and all levels of stardom. Occasionally, usually when things got extremely hairy, Booster would bump into an older version of himself--who would generally operate behind the scenes to help his younger self and his son. When his series ended just before the DC Universe went kaboom, it was unclear whether or not Booster's history as a Time Master would be retained, or whether he would be reset to his 1980s status quo as a superhero pitchman. Jurgens dropped hints along the way that Booster and Rip's operation was still up and running in secret, but it was never stated outright and after a certain point, you start to question whether your favorite stories "happened" if they've never been referenced on the page. 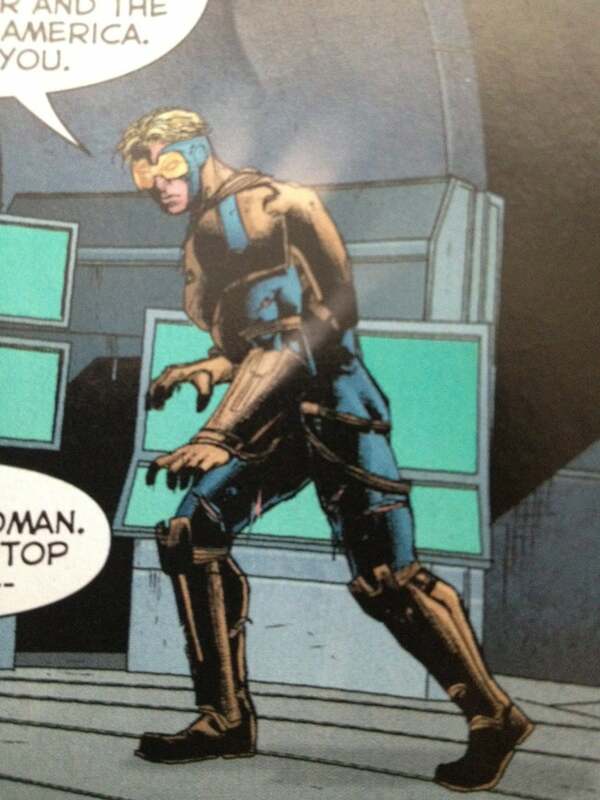 Well, in the Annual, we see Booster's older self for the first time since the New 52 began. He references Rip Hunter. He saves the day by defeating an unstoppable foe. As a fan of Booster Gold, I should have been elated. Should have been. The way Old Booster was depicted left a lot to be desired, and by the time anything positive came out of this issue at all, I'd already slogged through the better part of a really unimpressive comic. For five bucks (or ten, if you're nasty).